Ralph Clements Sheppard, ‘C’ Company, 1st Battalion Royal Inniskilling Fusiliers, lived in Derry from 1908, enlisted there, and died onboard H.M.S. Sicilia, from wounds received in action at the Dardanelles, on May 26, 1915. 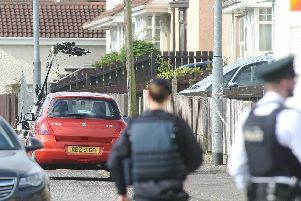 He was a member of First Derry Presbyterian Church, and the son of Mary Eleanor Sheppard, 3, Park Villas, Londonderry, and Magheracregan, Castlederg. Lance Corporal Sheppard was formerly a member of 1st Derry Company of Boys’ Brigade, and had four years’ military service. Although Soldiers Died In The Great War declares that Ralph Clements Sheppard was born at Drumkeen, County Fermanagh, The County Donegal Book of Honour 1914-1918 lists him as having been born at Drumkeen, County Donegal. The book also contains a picture of the dead soldier as well as some additional information – possibly supplied by Ralph Sheppard, Carnowen, Raphoe (a nephew of the dead soldier) – which states that Lance Corporal Sheppard’s father, Joseph, was born in Limerick, and was a school teacher in County Tyrone, where he died in 1918. Lance Corporal Sheppard’s Will, dated April 9, 1915, left the whole of his property and effects to his father. Samuel Spears, 2nd Battalion Northumberland Fusiliers, was born at Londonderry, enlisted at Middlesborough, Yorkshire, and died in Flanders on May 26, 1915. Aged 34, he was the husband of Mary Spears, 13, Winifred Street, Workington, Cumberland, England. His name is recorded on the Ypres (Menin Gate) Memorial, Ieper, West Vlaanderen, Belgium. The 2nd Battalion Northumberland Fusiliers was a regular army battalion, stationed at Sabathu, India, as part of the 9th (Sirhind) Brigade, 3rd (Lahore) Division, at the outbreak of World War 1. It departed Karachi on November 20, 1914, arrived at Plymouth on December 22, and proceeded to Winchester where it joined the 84th Brigade, 28th Division. It moved to the Western Front in January 1915, and its first major action was during the German gas attack at Second Ypres. William Mitchell, ‘C’ Company, 1st Battalion Royal Inniskilling Fusiliers, died at the Dardanelles on May 28, 1915. Aged 18, he was the son of William and Elizabeth Mitchell, 13, Lower Nassau Street and the Culmore Road, Londonderry. Being Unionists, William and other members of his family signed the Ulster Solemn League and Covenant (September 1912) pledging resistance to Home Rule for Ireland. Private Mitchell was a member of Great James Street Presbyterian Church, and the Murray Parent Club of Apprentice Boys of Derry. He was also a member of the Orange Order, and his name is recorded on a memorial dedicated to the memory of members of the brethren of City of Derry Temperance Loyal Orange Lodge 1007, Coronation Loyal Orange Lodge 1062, Royal Union Loyal Orange Lodge 1166, and Royal Black Preceptory 237, who made the supreme sacrifice in the Great War, 1914-1918. His name is also recorded on the Helles Memorial, Turkey, and commemorated on the Diamond War Memorial. Lies within our hearts concealed. Hugh McLaughlin, 1st Battalion Royal Inniskilling Fusiliers, was born at Buncrana, County Donegal, on March 17, 1896. He enlisted at Derry, and died at the Dardanelles on May 29, 1915, with the Mediterranean Expeditionary Force. Aged 19, he was the eldest son of Hugh and Annie McLaughlin, 3, Upper Nassau Street, Derry, and his name is recorded on the Helles Memorial, Turkey. His name is also commemorated on the Diamond War Memorial. But not too far to think of thee’. Robert Quigley, 2nd Battalion Royal Irish Regiment, was born at Glendermott, County Londonderry, enlisted at Londonderry, and died in France on May 30, 1915. He was the husband of Grace E. Le Page (formerly Quigley), La Croutes, St Martin’s, Guernsey, and his remains are interred in Boulogne Eastern Cemetery, Pas de Calais, France. Robert Quigley’s Will, dated August 9, 1914, left the whole of his property and personal effects to his wife, who was then residing at 11, Paris Street, Guernsey. On May 3, 1915, four weeks before the death of Private Quigley, the 2nd Battalion Royal Irish Regiment had their first experience of poison gas at the Second Battle of Ypres but held their line. On the 8th and 9th, they were heavily shelled all day. During the night of the 9th-10th, they were relieved by the 11th Rifle Brigade and marched to rest billets about one and a half miles north east of Poperinghe. After four days’ resting, the battalion returned to the trenches for four days. Four more days’ resting followed and then the battalion returned to the trenches in the vicinity of Irish Farm. At Bellewarde Ridge on May 24, at 2am, the battalion stood to arms. At 2.20, the enemy, preceded by gas, attacked. A gentle breeze blowing from the north east brought the full volume of gas on to that part of the line occupied by the battalion. Although respirators and sprayers were used, many of all ranks were overcome by gas. Shell Trap Farm, which was garrisoned by two platoons of another unit, was captured by the enemy, this enabling them to enfilade the Royal Irish portion of the line. They worked down the line bombing with hand grenades and only a few men of the Royal Irish now being left, took it as far as the right of the ‘King’s Own.’ Here, the attack was checked, the enemy holding the ground he had taken. At 6pm, the remnants of the battalion was collected by Regimental Sergeant Major Plunkett and bivouacked at Le Breque. Two platoons of ‘A’ Company, who were in support, held on until the following morning, when they were relieved and joined the remainder of the battalion. Lieutenant McKay, who was the only officer of those who were in the trenches, assumed command of the battalion, which bivouacked on the east bank of the Yser Canal. James Heaney, Royal Fleet Reserve, Howe Battalion, Royal Naval Division (RFR/DEV/B/5603), died at the Third Battle of Krithia, Dardanelles, on June 4, 1915. He was the brother of Archibald D. Heaney, 25, Benvarden Avenue, Londonderry, and a member of Waterside Presbyterian Church, Londonderry. He also belonged to Churchhill Loyal Orange Lodge 871. His name is recorded on the Helles Memorial, Turkey, and commemorated on the Diamond War Memorial. Leading Stoker Heaney had twelve years’ service on the navy, and served with the naval division at Antwerp. On the day of his death, the Howe Battalion suffered 8 officers and 107 other ranks killed in action, another 10 other ranks later died of wounds. Initially, the recruits of the Anson, Howe and Hood Battalions of the Naval Division had done well that day. They captured the first Turkish line in front of them in from five to fifteen minutes, and then burst through the second Turkish line in another spurt. In less than half an hour the men of the Naval Division had penetrated a third of a mile in the enemy’s front, and were consolidating the conquered ground. Later, however, they were forced to retire with heavy losses. James Maltseed, 1st Battalion Royal Dublin Fusiliers, was born at Derry, and enlisted at the industrial centre of Kirkintilloch, Dumbartonshire, eight miles from Glasgow. He died at the Third Battle of Krithia, Dardanelles, on June 4, 1915, and his name is commemorated on the Helles Memorial, Turkey. Other 1st Dublin Fusiliers’ fatalities on June 4, 1915, include Lieutenant Walter Alfred Leland, 10th Battalion Bedfordshire Regiment, attached 1st Dublin Fusiliers, and Lieutenant Hubert Frederick Garrett, 9th Battalion East Yorkshire Regiment, attached 1st Dublin Fusiliers. Like Private Maltseed, both men are remembered on the Helles Memorial. Rupert Hancock Bertram Peake, 2nd Battalion Hampshire Regiment, was born at St Martin’s, Guernsey, Channel Islands, enlisted at Port George, Guernsey, and died at the Third Battle of Krithia, Dardanelles, on June 4, 1915. Aged 32, he was the son of Thomas and Harriet Peake, Ash Street, Fleetwood, Lancashire, and husband of Sarah Jane Peake, 12, Pine Street, Londonderry. He was also the father of Ethel Maud Peake – who died on May 7, 1915, and was buried at Glendermott New Burying Ground – and his name is commemorated on the Helles Memorial, Turkey. Sergeant Peake died during the Third Battle of Krithia. Fought on the Gallipoli peninsula during World War I, it was part of a series of Allied attacks against the Ottoman defences. The allied aim was to facilitate the capture of Achi Baba which commanded most of the peninsula. The attack began at noon on June 4, 1915. That day, the 2nd Battalion of the Hampshire Regiment from the 29th Division, advancing along Fir Tree Spur alongside Gully Ravine, managed to advance but having lost contact with the Sikhs on their left were forced to defend along the bank of the ravine as well as to their front. Elsewhere, the 29th Division advance was held up with heavy casualties by Ottoman strongpoints. James Herbert Staveacre, 7th Battalion Manchester Regiment, died at the Third Battle of Krithia, Dardanelles, on June 4, 1915. Aged 42, he was the son of James and Marianne Staveacre, Stockport. His remains are interred in Redoubt Cemetery, Helles, Turkey. Redoubt Cemetery, which took its name from a chain of forts made by the Turks across the southern end of the peninsula, was begun by the 2nd Australian Infantry Brigade in May 1915 and continued in use until the Dardanelles evacuation. It was greatly increased after the 1918 Armistice when the battlefields were cleared and graves were brought in from small cemeteries in the vicinity. Major Staveacre was a partner in the firm of Leinster Brothers & Staveacre, shirt and collar manufacturers, of Londonderry, Manchester, and 8, Moor Lane, London. He was a member of the 7th Mounted Infantry company when his brother – Captain Staveacre – was the commander. When that unit was abolished by the War Office his enthusiasm led him to continue his service with the Infantry Battalion. He was appointed to command a company. He served in the South African War, and the experience gained there he used to his best advantage. He frequently lectured to his men on the lessons of the South African campaign. ‘Jimmy’ Staveacre – the name he was known by among his friends – was also well known in the athletic world. He was an all-round sportsman. Lacrosse and football were among his games. Boxing was a favourite exercise, and he was a good horseman. On the lacrosse field at one time he was a prominent figure. He was a member of the Stockport and Offerton Clubs and had also represented Cheshire. He was a member of the Manchester Athletic Club. The ‘Seventh Manchester Sentry,’ which was published by members of the battalion at Khartoum, contained many interesting articles on sport from his pen. Some years before his death he contributed lacrosse notes to the Manchester Guardian.